Yet more violence and bloodshed in the history of the fine spangled sort of canary. 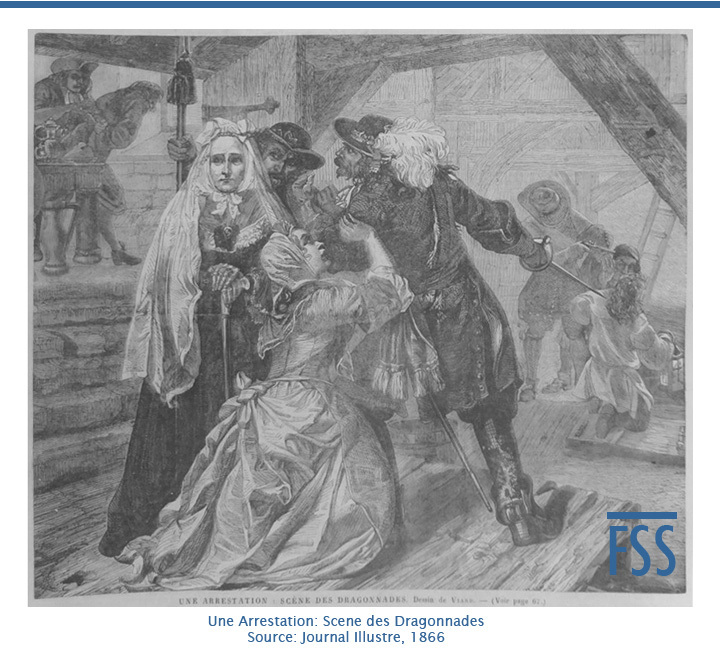 The illustration from Paris Illustré (1) shows a scene from the dragonnades: the arrest of a Huguenot family at sword point. The dragonnades had begun four years before the Revocation of the Edict of Nantes in 1685. Protestants who refused to abjure had only two options: they could either suffer the consequences, or they could flee. The penalties for Huguenots attempting to emigrate were harsh: men were sent to the galleys (2); the women to convents; their children brought up as Catholics; and their property confiscated by the King. Isaac Dumont De Bostaquet (3) was one of those who decided to flee. De Bostaquet was a gentleman farmer from Normandy. He was three times married, with 19 children, of whom 13 were alive when the Edict of Nantes was revoked. He had served in the French cavalry in his youth, but a classical education and an advantageous marriage ensured that he could enjoy life on his two estates in the style of a French nobleman. Above all, he was a committed Protestant; a Huguenot. Things came to a head in 1687. An opportunity arose to rendezvous with an English vessel lying off the coast. The plan was for his wife and children to escape; De Bostaquet intended to follow later that year, presumably hoping to sell his properties in order to raise funds. Travelling at night, De Bostaquet led his family to the coast. There they were intercepted by the coast guards near the shore; two men on horseback assailed them, firing at De Bostaquet and hitting him in the arm. De Bostaquet, his heart ‘torn by a thousand conflicting emotions’ made his escape, leaving his family ‘in the hands of Providence’. They never saw the ship. De Bostaquet found a Huguenot doctor who treated the wound but could not remove the ball, believing it to be lodged between the two bones in his upper arm. He could not risk retuning home, and still bandaged and bleeding, he headed via Normandy, Picardy and Flanders towards Holland. De Bostaquet was fortunate in that he knew the country and could rely on his family connections to help him along the route. Two more doctors probed his wound, but no ball could be found. The wound grew angry, and he feared the onset of gangrene before the ball was found in the finger of his glove! (I’m only repeating his account – HE) With no further need for intrusions from doctors and their instruments, the wound healed. The journey was an eventful one. De Bostaquet ‘traversed woods, swam rivers and had many hairbreadth escapes’; he was set on by footpads (5); and after ‘many adventures and perils’, he reached Ghent and safety. He was eventually joined by his wife, a son, and one of his daughters who had escaped by sea. It was only then that he discovered that the other members of that original escape party had been caught: the men sent to the galleys, the women to a convent; his land and properties confiscated by the crown. Once recovered, De Bostaquet moved to Rotterdam where he found so many French exiles that he described it as ‘quite Frenchiefied’. While there, he was instrumental in covering up a duel fought by one of his friends who had killed his adversary. The sword of the dead man was placed back in its scabbard to make it look as though he had been the victim of a surprise attack. Duelling was illegal, and had De Bostaquet’s involvement been uncovered he could have been imprisoned. The authorities investigated, but no witnesses came forward. They got away with it. De Bostaquet was known to William of Orange, but felt he needed evidence of his commitment to Protestantism to win the Prince’s favour. That is when he started writing his manuscript, and that is how we know of his escapades. He succeeded in winning a commission as an officer in William’s army and joined the invasion force that resulted in the Glorious Revolution of 1688 (6). Once William III was established on the English throne, and England’s status as a Protestant nation was secure, De Bostaquet sailed to Holland, collected what remained of his family, and returned to England. He continued his military career in Ireland and wrote graphic accounts of the Battle of the Boyne and the Siege of Limerick. He died in Ireland in 1709. (1) Two of the dragoons look for instructions from the woman standing impassively on the left. I am guessing, but she looks suspiciously like Madame De Maintenon, the mistress, and later the morganatic* wife of Louis XIV. She is widely believed to have persuaded Louis to revoke the Edict of Nantes. If my guess is right, this illustration from Paris Illustré is rewriting history: shifting the blame for the dragonnades on to her, and away from the Sun King. (*A morganatic marriage is one which usually takes place in secret and is not officially recognised, usually because of a difference in social rank). (2) The galleys were a type of war ship powered by 260 oarsmen rowing with oars 12 metres long. They had the advantage of being manoeuvreable when there was no wind, but otherwise were inferior to a man of war under sail. Conditions were appalling. The oarsmen were cramped together and chained 24 hours a day, constantly sprayed by salt water, beaten and whipped. Losses in battle were high, but at least as many died from depravation. Almost half of the Huguenot oarsmen died before they were released. (3) De Bostaquet wrote a manuscript of his life, which was published in 1864 as Mémoires d’Isaac Dumont de Bostaquet gentilhomme normand sur les temps qui ont précédé et suivi la révocation de l’édit de Nantes. It was quoted extensively by Samuel Smiles in The Huguenots in England and Ireland ,Chapter X (1867). Also by Dianne W. Ressinger in War, Religion and Service: Huguenot Soldiering, 1685-1713, Chapter 8 (2007). I have relied extensively on these two sources. (4) Assemblées du Désert (Services in the Desert) were secret religious services held by ‘New Catholics’ in woods, mountains and caves to avoid detection. Attendance had its dangers; there were spies willing to inform the military for a reward. (5) A footpad was what we would now call a robber or a mugger. (6) The Glorious Revolution was almost a bloodless coup. James II, the Catholic king of England and Wales, was overthrown despite his policy of religious tolerance. His religion, his ties with France, and the birth of a son that placed a Catholic first in line of succession, was too much for the Protestant Parliament to bear. William of Orange and his wife Mary (James’ daughter, but a Protestant) were invited to take the throne. James lacked the resolve to fight and was allowed to escape. He ended his days as an exile at the court of Louis XIV.